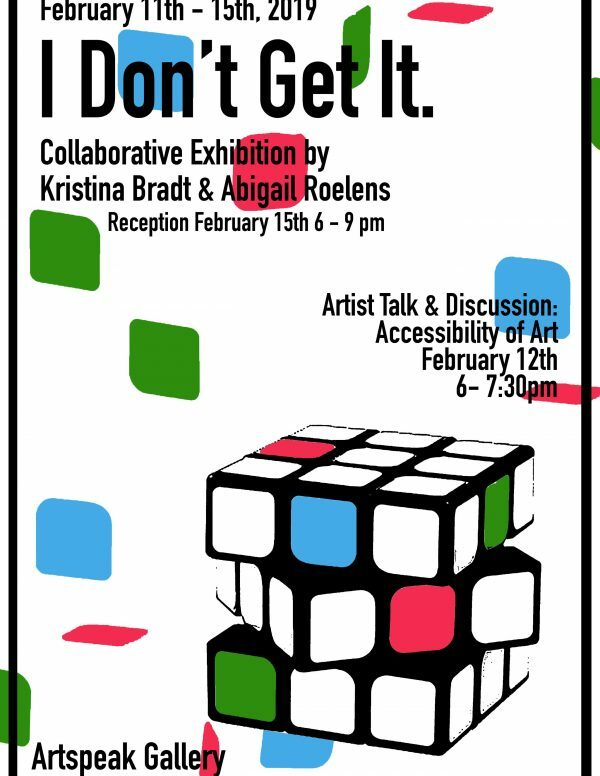 “I Don’t Get It” is a collaborative exhibition featuring visual art by Kristina Bradt and written poetry by Abigail Roelens. The exhibition explores the accessibility of art across artists and audience. A talk given by the artists that further explores their concept and process is on February 12th at 6:00 pm. This talk is free to the public. A closing reception will be held on February 15th at 6:00pm. Free refreshments are provided. The artists would like to thank the Arts Council Windsor & Region for hosting this exhibition, and to the City of Windsor for their funding of the exhibition. This project was funded through the Windsor Arts Culture and Heritage Fund. Abigail Roelens – is a recent graduate of the University of Windsor, where she majored in psychology and creative writing. She uses poetry and creative essays to explore themes of memory and repetition, myth-making, psychological disorders, and personal narrative. Currently, she has about a thousand different projects imagined, but nothing committed to paper. I Don’t Get It is her first exhibition of work. Kristina Bradt – is a Windsor-based artist and public art enthusiast. Her practice explores different mediums such as sculpture, sound, digital and most recently drawing based work. Kristina earned her BFA in Visual Arts from University of Windsor (2017) and has spent the past 2 years exhibiting her work in various galleries in the city and expanding on her graphic-quality drawing style. Themes in her work revolve around the study of people, their everyday surroundings, and the interactions between the two. She has been known to use imagery of fortune cookies, personifying them in a way to reflect on notions of fate, belief, and understanding. She often gravitates towards objects that are overlooked and underestimated, looking to highlight a deeper meaning in their existence in a playful, but ominous way. She will be completing her first Self-Directed Residency in February 2019 at Artscape Gibraltar Point on Toronto Island for her 3D soundscape work.